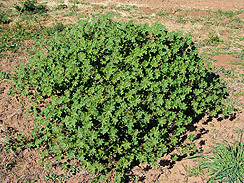 Mallow grows plentifully during Spring in fields and roadside wild areas. Here in my area, it does especially well around 500 feet above sea level. I’ve not found it at higher altitudes. 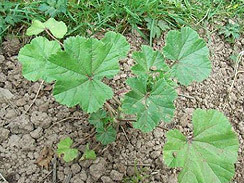 This plant can grow in small clusters close to the ground, or in huge three-foot-tall patches spanning twenty feet wide. It’s leaf shape reminds me of a lily pad with corners. Dice tomatoes, cucumbers and onion. Cut mallow leaves and beet greens into thin strips. Combine into salad and toss with your favorite dressing (I recommend tangy vinaigrette), mix in fennel seeds. My neighbors’ grape vine wildly tangles 30′ up into their trees. This spring, while the bright green leaves pushed larger than my hand, before fruit began to form, I collected 20 or 30 leaves. With those in hand, I read a few dolma how to’s online, checked my fridge for unused lurking wild edibles, and hit the trails to collect a few more. Here’s the recipe I came up with, making dolma as traditionally as I knew how. BTW, my neighbors practice meditation and avoid petro-chemical fertilizers, recognizing our ecoscape as an interconnected web. Organic grape leaves right across the street, lucky me. Hydrate your texturized vegi protein, adding a liberal shot of liquid aminos and/or soya sauce in your hydrating liquids for added flavor. Shred all of your wild edible greens into 1″ x 1/8″ strips. Chop dried cranberries into slices. Heat 1 tbsp olive oil on medium high heat, sauté/toast almonds until slightly brown. Remove to large mixing bowl. Heat 1 tbsp olive oil over medium high flame for 30 seconds, then add sliced/chopped sweet onion and sauté for 30 seconds, next adding diced garlic and sautéing until all are transluscent and slightly golden. Add another tblsp olive oil, allow to heat for 15 seconds, then stir in tomato paste. sauté for 30-60 seconds, then remove from flame. Place sautéd ingredients into mixing bowl with almonds, adding shredded greens, uncooked rice, hydrated tvp, cranberries, bustard flowers and elderflower buds. Stir all ingredients, adding liquid aminos and pepper to taste. Heat at least 1 gallon of water in a large pasta pot. Put on high flame. While water is warming, rinse grape leaves to remove insects and dust, remove stems being careful not to tear the leaves. Prepare a sink 1/2 full of cold water. Set aside 5-7 grape leaves; these will be used later and do not need to be blanched. Once the pot of water comes to a low boil, it’s time to blanch the remaining grape leaves. 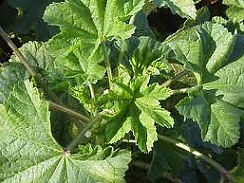 The intention is to soften the leaves just enough to make them pliable without damaging their texture. Insert all of the grape leaves into the low-boiling water, and stir very gently for a few seconds making sure he leaves separate. Immediately remove grape leaves from hot water and place gently into sink of cold water. Once leaves have cooled, remove carefully to a plate. Prepare a large pot by placing an inverted plate on the bottom; this protects the dolmas from direct heat during the cooking process. Lay the unblanched grape leaves over the plate and along exposed bottom or side surface of the pot, further protecting the dolma during cooking. Place one grape leaf shiny side down on a cutting board. Place 1 tbsp of stuffing on the leaf, compacting the stuffing in your palm before hand. Use more or less stuffing depending on the leaf’s size. Fold in the leaf’s right side, then left side, then roll tightly. Place into the pan. Repeat the process until all your leaves have been stuffed, placking the rolled dolma tightly against one another in the pot. Drizzle the juice of 1 large lemon evenly over your dolma, then add water until the liquid level rises a little over the plate. Bring to boil, then immediately reduce to simmer and cover with lid, continue simmering for as long as it takes rice to cook. Begin checking at 30 minutes, then every 5-10 minutes afterwards, adding 1/4 cup water if cooking water evaporates. Once rice is done, drain off any remaining liquid, then drizzle juice of 1 lemon evenly across cooked dolma. Allow to cool in pot before removing, as moving while hot can damage your little beauties. You can eat them hot, warm, or cold. I find they’re especially(!) tasty the next morning after they’ve chilled all night in the fridge. 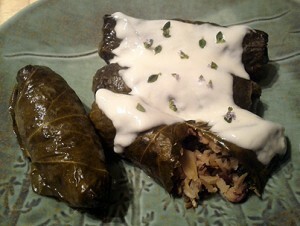 NOTE: Instead of using grape leaves as dolma wrappers, you can alternately use large mallow leaves the size of your palm. Stir honey into yogurt and drizzle over dolma. Sprinkle with fresh oregano flowers or other garden herb. Bon appeite! Beti avon.